Johns Hopkins University wants its own police force in a city with a testy relationship with policing and Johns Hopkins itself. The lead-up to the situation has been convoluted, confusing, and frankly, absurd — at least, for those who have opposed Hopkins’ efforts since it began one year ago (and full disclosure, I am a recent Hopkins graduate, a former Editor-in-Chief of their campus student newspaper, and have attended meetings held by Student Against Private Police and canvassed a city block for them). A preeminent research institution produced disputed research and discounted condemnation from its own professors. A purported majority in support of a Hopkins police force is content on remaining silent. Promises for community forums have not been fulfilled, and the ones that are held are described as not representing the views of the community. Baltimore, a city struggling with a violent reputation, is looking for peace and Hopkins offers an implicit Faustian bargain for those in power — give us our own police and we will support your political campaigns and direct state funding towards you. The debate surrounding this police force falls within larger questions the city grapples with: What rights and privileges should the government give to private institutions? Who in the community are listened to and who are just heard? What forms of policing are accountable to the people they patrol — black citizens, LGBTQ folk, survivors of sexual violence, the individuals who face the brunt of police misconduct? Does such a form of policing exist — and if it does, can Hopkins pull it off? I’m just a bill. Yes, I’m only a bill. Watch out for the lobbyists and shills. In the Maryland Legislature, House Bill 1094 and Senate Bill 793, which have identical text, authorize Johns Hopkins to have its own police force. To become law, both bills would have to pass both their respective House and Senate City Delegations, House and Senate Judiciary Committees and then the House and Senate floor. Governor Larry Hogan has already said that he would sign the bill if passed. As of press time, SB 793 had gone through the entire Senate vote process with several added amendments. The House Judiciary Committee passed the Senate version of the bill and added their own amendments on Thursday, March 21. The bill currently awaits a House floor vote and if it passes there, which is likely, the variations between the House and Senate versions of the bill would be reconciled before Hogan’s signing. When the Maryland legislative session began on January 9, Hopkins had yet to release its draft bill. Several weeks later, an unexpected but confirmed draft of the bill circulated on Twitter. Later that same day, Hopkins uploaded the draft to their website but did not formally announce its existence until a week later. SB 793 and HB 1094 were introduced to the General Assembly on February 4 and 8 respectively. 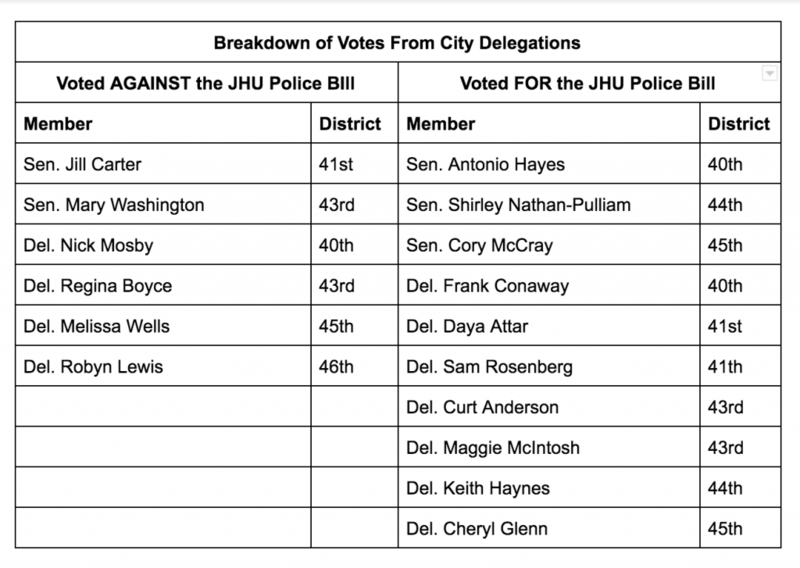 As this bill confusingly trickled into existence, opponents of the police force identified the Senate city delegation as a chokepoint where they could end the legislative process. Of the six members on the delegation, Sen. Bill Ferguson recused himself as a Hopkins employee, Senators Mary Washington and Jill Carter opposed while the last three senators — Antonio Hayes (who sponsored the bill), Corey McCray and Shirley Nathan-Pulliam — had yet to make a stance. February 22 was the day to change minds as parties went to Annapolis to testify before the House and Senate city delegations and Senate Judiciary Committee. While supporters of the bill like Johns Hopkins President Ronald Daniels had ample time to testify, the numerous students who coordinated transportation, skipped class and put off studying were allotted minutes to explain why they thought the bill should not pass. During a bitter City Senate Delegation vote on March 7, Senators Washington and Carter proposed amendments introducing more accountability mechanisms and community funding only for them to be voted down. SB 793 passed 3-2 and then passed the senate judiciary committee in the following days. HB 1094 passed the Baltimore City Delegation on the 12th after a surprise testimony from Congressman Elijah Cummings in support of the bill and a disruption from SAPP. Following the protest, SAPP stated that they were compelled to act against what was a “fundamentally undemocratic and rushed process,” echoing concerns from faculty and community groups. Those who voted for the bill must have thought otherwise. “A Spoonful of Sugar Helps the Private Police Go Down:” What’s in the bill? HB 1094 and SB 793 are both called the “Community Safety and Strengthening Act,” a name Senators Washington and Carter contested during the Senate voting process as the bill would primarily authorize a Hopkins police force. This year’s bill’s name differs from a failed draft Hopkins submitted last year called “Baltimore City – Independent Institutions of Higher Education – Police Force,” which was more explicit with their intentions though more clumsily worded. No more than one hundred employees — in practice, this will average 10 to 12 armed officers and two to three supervisors at any given time across all three campuses. Complete trainings to ensure “constitutional and community-oriented” policing that includes addressing behavioral episodes and implicit bias against race, sexual orientation and religious minorities. Will not be granted the typical immunities given to regular police officers. Additionally will not be able to receive state pensions or other governmental benefits. They can police the following areas on the Homewood, Peabody and East Baltimore Campus. Note that these outlined areas are almost entirely Johns Hopkins properties. The department would be subject to the Maryland Public Information Act (MPIA) despite Hopkins’ status is a private institution. This means that people can request public records from the department. Private universities police departments have argued in the past that they are not obligated to provide requested records. The department would be subject to the Baltimore Police Department’s (BPD) Civilian Review Board and another Accountability Board composed of 15 students, faculty, staff, and community members. Of the faculty and staff, one must be black. Note that Hopkins has the power to appoint nearly all of the members of the Accountability Board with Senate approval. The Accountability Board would have the authority to review policies and procedures and provide recommendations but not discipline officers. If the bill becomes law, further details will come out of a Memorandum of Understanding Hopkins will write with the BPD which would require two community forums and a public comment period. Critics of the bill have pointed out that much of the added investment comes almost entirely from state funding — not Hopkins. In its defense, Hopkins can point to bill provisions where they would set up a police athletic league at their own expense and give $100,000 to the East Baltimore Historical Library if the state matches the grant. Apart from what is in the bill, in forums and testimony, administrators have pointed to programs that address systemic roots of crime and serve the community like HopkinsLocal, which directs the institution to hire and buy from poorer zip codes, and Vision for Baltimore, which has helped provide over 5,000 pairs of glasses to Baltimore school children. Other Hopkins “investments” have garnered controversy like its East Baltimore Development Inc. which has displaced over 700 primarily black families in the Middle East neighborhood by the medical campus. Their cited investments pale in comparison to the citywide windfall that would come if Hopkins paid taxes for its enormous concentration of property and assets in Baltimore (this is a story for a different time). All in all, the current bill is substantively more detailed and restrictive than what Hopkins first submitted last year, which in essence, requested a blank check for a police force. In a statement, Hopkins spokesperson and Vice President of Communications Susan Ridge wrote that the University “appreciated” the additional amendments adopted by the Senate. SAPP member and Hopkins political science graduate student Quinn Lester acknowledges this assessment: “On paper, this probably is the most progressive campus police authorization in the country,” he told me. Who Is For or Against the Police Force? A Quick Rundown of Major Parties. In Support: Mayor Catherine Pugh, Former NYC Mayor and major Hopkins donor Michael Bloomberg, The Charles Village Civic Association, The Tuscany-Canterbury Neighborhood Association, The Charles North Community Association, Congressman Elijah Cummings, Maryland Senate President Thomas V. Mike Miller, Numerous condescending Baltimore Sun Reader Responses who have little affiliation with this issue, and Sun pundit Dan Rodricks, The Editorial Board of The Baltimore Sun, Former Baltimore Mayor Kurt Schmoke, Former BPD Commissioner Kevin Davis, Maryland Governor Larry Hogan, and BUILD (Baltimoreans United in Leadership Development). In Opposition: 74.5% of Hopkins undergraduates based off of a Student Government Association referendum (35% of undergraduates participated in the referendum), 53% of Public Health Graduate Students, Over JHU 100 faculty (including nearly all the black faculty) who signed an open letter, Unite Here Local 7 (union representing the dining workers at Homewood campus), 2700 petition signatures from a Hopkins affiliates, The Johns Hopkins Black Student Union, The Greater Remington Improvement Association (GRIA), The Abell Improvement Association (who voted 40-0 against the police force), BRACE: The Baltimore Redevelopment Action Coalition for Empowerment, City Councilperson Ryan Dorsey, NAACP Legal Defense Fund, ACLU of Maryland, City Councilperson Mary Pat Clarke, (whose district includes Homewood), The Editorial Board of The Johns Hopkins News-Letter, and Leaders of a Beautiful Struggle. Hopkins contests the image of major opposition to their bill. In a statement, University spokesperson Susan Ridge pointed out that with more than 4,500 faculty and nearly 15,000 students, they expected a “variety of opinions” but that “many in our community” support the creation of a force. Among those who have voiced support for the bill, many have argued that there is a crisis of crime in Baltimore and Hopkins’ force could help address it. Whose safety exactly? According to Lester, the dozen or so officers on duty at any one time would not be able to lower crime as supporters would hope. Given the current powers police have in the bill, a Hopkins cop would be able to address “quality of life” crimes often associated with zero tolerance and broken windows policing. In Lester and other SAPP members’ eyes, this police force would be a tool to aid in Hopkins’ gentrification of local neighborhoods — a strategy well-documented in nationwide cases of gentrification. Furthermore, between a Hopkins PD and the BPD, Lester argues that there would be an “accountability black hole” where cases neither department wants to handle could fall through the cracks. What does crime on campus really look like? According to Hopkins’ numbers (which have been cited to have discrepancies between themselves and between BPD statistics), theft — the main crime a potential police force would investigate — rose slightly to 43 reports at the Homewood campus and to 32 reports at the medical campus in 2017. Aggravated assault, a crime many supporters of the bill worry about, has gone up in Hopkins’ data but a police force currently does not have authorization to investigate those crimes. The largest reported crime that supporters of the bill do not mention are liquor law violations — it is a college after all. However, the far more concerning unspoken crime is sexual assault. In Hopkins’ 2018 annual security report, they list 31 reports of sexual assault in 2017. However, this figure does not including the 101 confidential reports of sexual assault made to the counseling center. These confidential reports nearly tripled in numbers from the previous year in 2016. The Office of Institutional Equity, which investigates sexual misconduct, has been under intense scrutiny this past year after a Johns Hopkins News-Letter article described unacceptable student experiences with the office, an announcement that they had lost 18 reports of sexual misconduct and an alleged mishandling of an investigation into a professor accused of sexual assault. A Hopkins police department would not be responsible for investigating underage drinking and sexual assault, the two most prominent crimes on campus. The other argument for having a police force is that it would promote safety on campus, especially in emergencies. However, in a Washington Post op-ed co-written by Daniels, he himself argued that “even some trained law-enforcement officers perform poorly under such circumstances” like active shooter situations. Another Maryland bill allowing public school officers to carry guns was voted down on Saturday by the Baltimore City Delegation. Delegate Brooke Lierman argued that there was little evidence that armed officers kept schools safer. Folks have pointed out the irony that Lierman and other delegates who voted ‘no’ on this bill, voted ‘yes’ for the Hopkins one. How does Hopkins understand the city’s issues with police? Johns Hopkins administrators are aware of controversies around policing and the importance of addressing root causes of crime.During the first community forum last fall, Vice President of Security and former BPD Lieutenant Melissa Hyatt spoke at length about how officers would be trained to address unconscious biases and Vice President of Finance Daniel Ennis emphasized the University’s contributions in fixing street lighting and how that deterred crime. Unfortunately, there are obstacles to overcome before this “new era.” While administrators have learned to speak the language of progressive policing, many supporters of the bill have not — and many are requesting tactics rooted in fear, racism and classism. In verbatim comments to a Hopkins survey, staff wrote of their fear of the homeless, panhandlers, “druggies” and guys “who have a knife or gun hidden.” In these comments, many called for increased security to protect what one individual described as “a bastion of hyper-educated, well-off people.” One person also asked for a surveillance state. Assuaging these concerns would push a Hopkins police force towards discriminatory and overbearing tactics that Hopkins itself had denounced. What is a “private” police force exactly? : Hopkins has rejected the notion that they were trying to create a “private” police force. In Daniels’ prepared testimony from this year, he declared that a Hopkins force would be “public policing at its best.” Daniels, the president of a private university, made this “public” argument on the grounds that their legislative process had local input, that their accountability mechanisms would ensure public trust and that their policing policies would be community-oriented. Senator Mary Washington has been one of the most vocal critics of the bill on the basis that Hopkins, as a private entity, has no accountability to constituents and is instead beholden to its Board of Trustees. In an interview with Maryland Matters, she described Hopkins’ efforts as “akin to establishing a Vatican City within Baltimore, with its own army, its own laws.” There are additional fears that this would set a precedent for other groups in the city to privatize their own security. A group of businesses in Federal Hill, an affluent and white neighborhood, plans to deploy their own private security teams next month. In the University’s pursuit to sieve out its selected evidence, they missed conferring with relevant parties about their plans. City council member Robert Stokes, whose district includes part of the medical campus, told The Baltimore Sun that he was blindsided by the University’s actions. This was a reoccurring sentiment at community forums that the Hopkins held last fall. Déjà Vu: What happened during the last legislative session? Back in 2017, a spike in citywide crime prompted President Daniels and senior administrators to spend two weeks in November that year to visit the University of Pennsylvania in Philadelphia, the University of Chicago and the University of Southern California in Los Angeles to study their respective campus police departments. In March 2018, Daniels and CEO of Hopkins Hospital Paul Rothman sent a surprise email to the Hopkins community announcing their intent on having a Hopkins police force. In this email, they wrote “We wanted you to be informed early of this process” after the process had already gone on for several months. Baltimore’s overall crime, and fears of an active shooter were the main concerns they cited. The announcement faced immediate backlash from students, faculty and community members with many raising questions around accountability, community input, and policing practices. 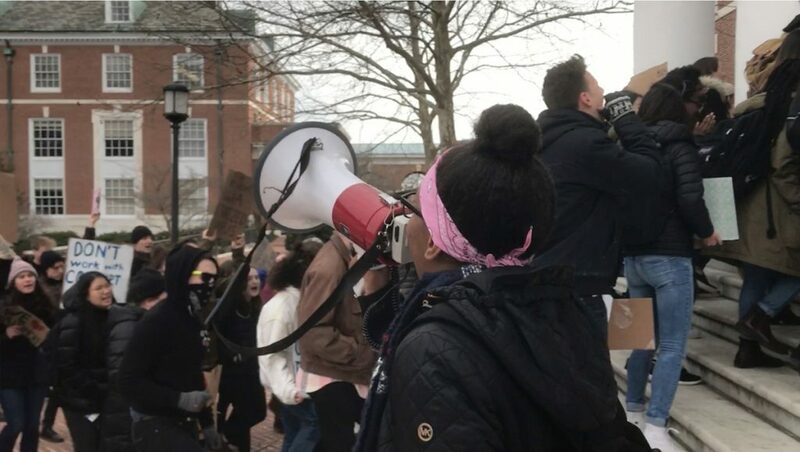 Two days later on March 6, in one of the largest campus protests over the past several years, over a hundred students rallied outside the library, marched through Gilman Hall and ended up in front of President Daniels’ house — an act unprecedented in recent memory. “We figured that if President Daniels is okay with sending a private police force into communities where people live, he wouldn’t mind some visitors at his own house letting him know what they think,” Kyro Meko, a protestor from that day, wrote in an email to The Johns Hopkins News-Letter. SAPP formed in this time and immediately began organizing against the bill, already submitted late to the General Assembly for that year. Legislators were skeptical of whether local community members backed the bill or were consulted. At a forum hosted by the Charles Village Civic Association on March 25, 2018, community members, nearly all who were opposed to the bill, called on administrators to make an apology. “This is a setback in the trust that we worked so hard to build with you, and I am sorry for that on behalf of the institution,” Vice President of Finance Daniel Ennis said, as reported by The Johns Hopkins News-Letter. Hopkins ended up making significant amendments to the original bill. However, at that point, delegates in the House Judiciary Committee had rescinded their support and called for Hopkins, a research university, to research the policing policy and community engagement it had failed to do. Hopkins spokesperson Susan Ridge did not directly answer a question asking whether the University has any regrets from the past year. Instead, she wrote that during the 2018 General Assembly, they found the need for a police department “urgent.” In the time since then, she wrote, they were able to conduct “more in-depth research” and incorporate feedback from stakeholders like students, neighbors and elected leaders. Considering the low bar set from the last legislative session, Ridge is correct. It was quiet over the summer 2018. In mid-autumn, the same arguments began again as Hopkins arranged a Discussion Series with self-selected experts and community forums that left attendees “dissatisfied” and “frustrated.” The same concerns reemerged: accountability, community input, transparency. It is said that history doesn’t repeat itself but often rhymes. In this case, it got pretty repetitive. I’ve watched this debate unfold over the past year and it reminds me of those cartoons with some character scrambling to plug water leaks in a hose. How will you prevent racial profiling? Our cops will be trained against that. Why do we hear so much opposition? It’s actually not a lot in comparison to total faculty and student populations. Can you show us who’s on board? We’ve heard private support and can show that we’ve had a lot of meetings. So on and so forth. Beyond this political tango, in a way, policing itself is a bit strange. We’ve established that it’s both legally and socially acceptable that cops have the special right to search, detain, and even kill. For some, this offers a sense of security — this is the bargain for our safety. For others, notably black and brown folk, this system offers menace — especially so in Baltimore with a strained history of police abuse. Hopkins, with either its self-confidence or its hubris, has waded into all this. If the institution, through this deeply contested and bitter political process, does end up with its own police force, let us hope it lives up to the ideals it is marketed to have. This article has since been clarified with the response rate to the Student Government Association Referendum.